Not long ago I received a phone call from a lady I had never met, whose name, Hunwi, is as unique as is the set of circumstances that led to her seeking us out. She is, along with some other like-minded women, in the process of purchasing some small acreage that is, not coincidentally, less than two kilometres from the Standing Stones site. 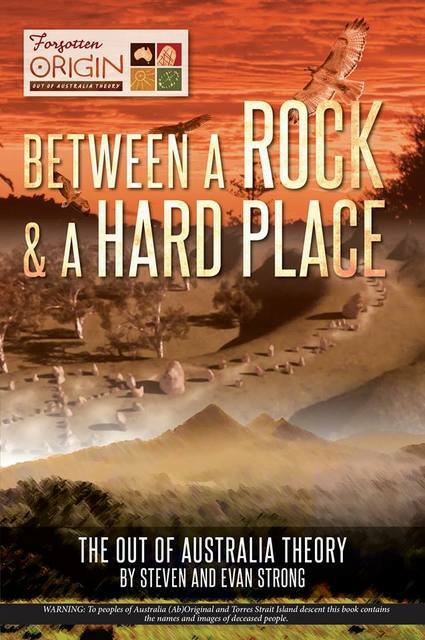 What Hunwi witnessed was a passing parade of rocks which she felt would be of interest to us, some of which she believed originally stood on the main sacred Standing Stones mound. 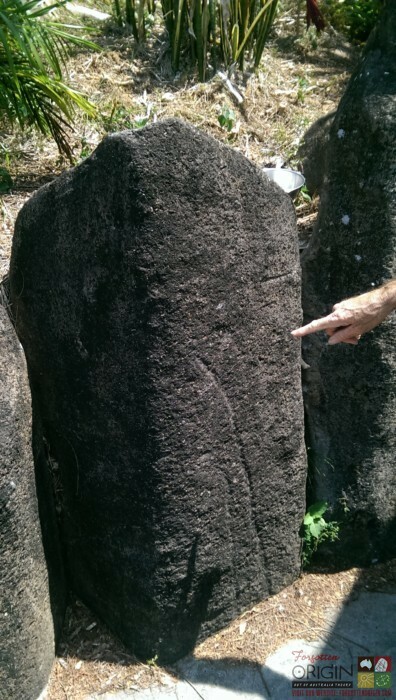 On an earlier visit to their prospective property, Hunwi saw a cluster of twelve Standing Stones positioned on the left-hand side of an internal road that continued on to the main quarry site. Soon after she returned with Original Elder Lois Cook and other interested parties to inspect these standing stones. Her return visit was a mixed blessing, in that the stones seen earlier had been removed, but directly above where they momentarily stood, the top soil had been removed and heavy machinery had been in motion. Hunwi spoke of massive slabs of rocks weighing tonnes, and more importantly shared with me the reasons why she was so convinced these are the same rocks that stood on the principle mound at the Standing Stones complex. That claim was always the missing piece in the Standing Stones puzzle. 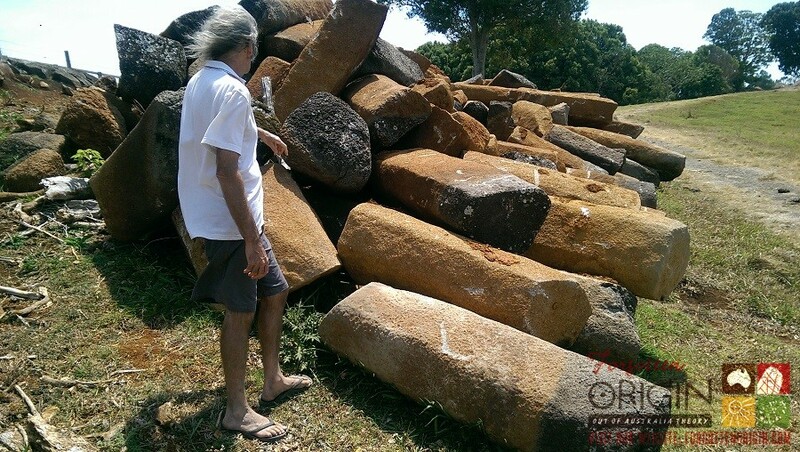 More than once the elderly farmer, who when fifteen was directed by his father to destroy the site, spoke of the “larger stones” being stored in the dairy. Lacking in specifics of timing or perpetrator, he recalled that at some time soon after the war they mysteriously vanished, he suspected they were “stolen,” perhaps at night, and to this day knows not where they lay. As to who, when or why his responses were vague and sometimes in conflict with earlier accounts, I put this down to being over ninety years old and thus clouding the edges of days long gone. Nevertheless, he was consistent in one important respect, these rocks were large and heavy and required specialised machinery. Until very recently, beginning in the 1940’s, this family had a monopoly in the area on the earth moving business, no-one but them had the machinery or expertise to bulldoze the Standing Stones site and move the bigger rocks over one kilometre to where the dairy did stand. My problem had been from first mention of this anonymous theft, they alone could move the rocks to the dairy or further on at their leisure. There was no other machine or operator capable of doing so bar the father and sons of this family. So if a theft of many huge stone monoliths did occur, which is not contested, the only people with the ability to remove and conceal are the same humans reporting the same theft. That is an absolute fact, and since no-one else in the area had the technology and motivation to move these rocks, they are the guilty parties. I suspect this secret was the reason his account was so erratic and contradictory. Even when in general conversation with X on the farm, the reason why the rocks were deliberately hidden was never far from the surface. There were many times I had to reassure him that the Lands Councils were not going to take his land away, I know his father was very fearful this would eventuate and that this concern is strongly held by his surviving kin. Undeniably if the Standing Stones had not been destroyed and hidden and still stood proudly, the land would be a public asset and treasure of unequalled stature. But if the stones, in particular those weighing tonnes, disappears from the public eye under a coat of red top soil, the old maxim of ‘out of sight out of mind’ would and still does apply. 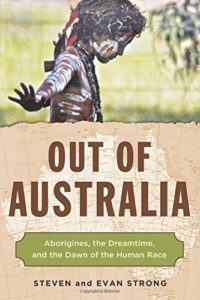 That all changed because of one person’s attention to detail, and before going any further the time is right for Hunwi to provide a first-hand account supplemented by an Original background. gather in the future and have gathered in the past. them to walk the land. were 3+ metres tall and 1to 2 metres wide also almost round to hexagonal in shape. special stories of Celebration, Renewal and Continuity. 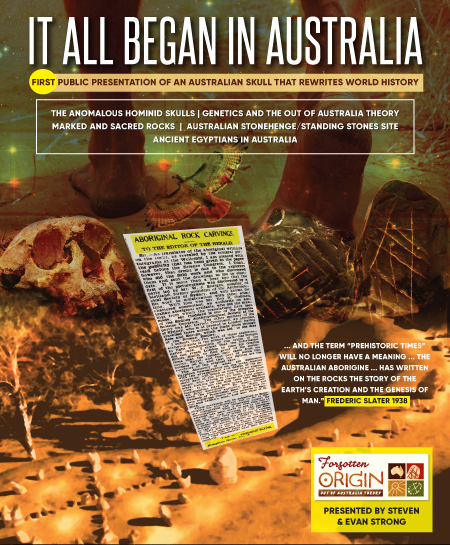 Profit alone and gather superannuation from the heritage of humanity? My very first response upon sighting this massive stack of rocks was more a reflex reaction ingrained around our belief that every rock on both mounds is imported sandstone, an unpreparedness for rocks of this size and, what was even more of a shock, the spread of black basalt across the slope just above the old quarry road. Basalt is igneous not sandstone, and was never mentioned in dispatches from Slater. But there amongst many of these basalt rocks is a thin veneer of a coat of what appeared to be sandstone. We are not experts in geology, although we are fortunate to have gained the trust and semi-encouragement of one of the most eminent geologists in the country, who often advises us and continues to so in anonymity for the very best of reasons. The rancour, personal insults and inflamed indignation that is so much of our ‘daily bread’ is a diet our friend understandably does not wish to partake. I did comment when on site, that this could be a coat of sandstone attached, but with wiser heads to act as counsel, it is now obvious this is not an unnatural event, but a patina. In nearly every case when a rock surface is exposed to the air and elements, a protective coat slowly forms, but my expert did send information on one instance where coating on basalt formed beneath the surface before exposure does take place. So what this does explain is that the larger rocks were never moved or cut into while Slater had access to the complex, as a result of the pristine state on site, they knew all smaller rocks were sandstone and because the larger rocks have a similar presentation and texture, it seems reasonable to assume that the larger rocks are also sandstone. My advantage was that these same rocks seventy years later had endured blades and disrespect aplenty since then, and we could see beneath and inside many broken rocks, the damage is already disgraceful and immense. On site, at our first introduction, without any briefing from our resident geologist or previous work with this type of geology, it was difficult to do any more than record, remember and await guidance, but there was one uncertainty that had to be considered and assessed. Standing on an old road that used to lead on to a long-term quarry and finding rocks of this magnitude near the entrance beside the edge of the road, is either due to being dumped or already being part of the local geology. Nearby there are two very small outcrops of basalt, the closest being two kilometres away, but to be realistic whether one hundred metres or two kilometres away if one large rock was picked up and transported anywhere the hands and machinery of one family are an integral part of this. Unless this one outcrop is a natural part of the landscape, the people who were responsible for the movement of hundreds of tonnes of basalt at this quarry had just destroyed, dismantled and stored the Standing Stones that stood on the main mound. However, before awarding a tick to either category, the geological stack-take is incomplete, on my second visit on site I came across three more stacks of the same rock coated in a reddish patina. The first and largest stack was at least equal in number and tonnage as that found by the road, and began just above the dam and ran up the slope alongside a newly formed gravel road for thirty odd metres. Further up on the same downslope beside the road, standing at least forty metres apart, was a much smaller stand of the same type of rock. Moving another twenty metres up the road at the top of the rise and end of internal cul-de-sac, there is another admittedly extremely small cluster of about five rocks which was is across the road some fifty metres away. In total there are four distinct stacks of the same type of rock, three are the direct result of a gravel road going through to the northern boundary of this subdivision, and these hidden imports were in the way. The largest collection of basalt slabs and rocks obviously sat within the area where the road was destined and was pushed out of the way and over the side of the road, which now forms a formidable rock wall to protect the integrity of the road running up a steep slope. What is interesting is what is revealed is a sheer face of four metres of the under-side of the hill totally exposed. 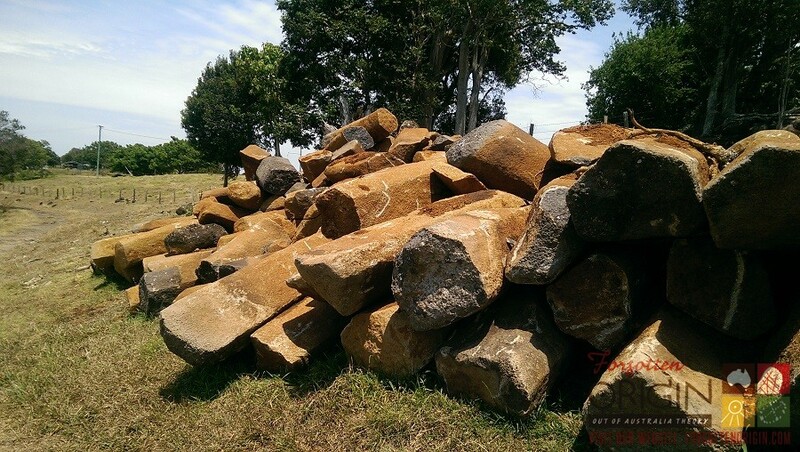 If this massive collection of columnar basalt rocks of varying sizes is natural, all that is left behind is the normal greyish loam soil found all over, and perhaps half a dozen ‘floaters’ of no more than five kilograms bearing the same reddish-brown patina. There is no basalt further below, so the entire deposit of basalt sat entirely within the top layer of soil, even though some of these rocks weigh tonnes and measure in metres, if a natural part of the local geology, these rocks were supposedly formed then sat just below the surface and extended no deeper than the present day level of this new gravel road. The next two up the slope are even more problematic for any maintaining these are natural outcrops. The larger of the two is on the same side of the road but separated by forty metres and is no more than forty rocks in number, if this is a third naturally occurring outcrop of columnar basalt, it has to be the smallest deposit found on the planet. But of course, such an observation is flawed perhaps ten times over, at the last and highest stand of basalt the tally is in single figures and sits apart and above the others. A long time ago all of these rocks were dumped and covered, and remained concealed until the machines began to excavate and gouge. All are found just on or slightly beneath the surface and are way too big and heavy to be naturally occurring if that shallow. 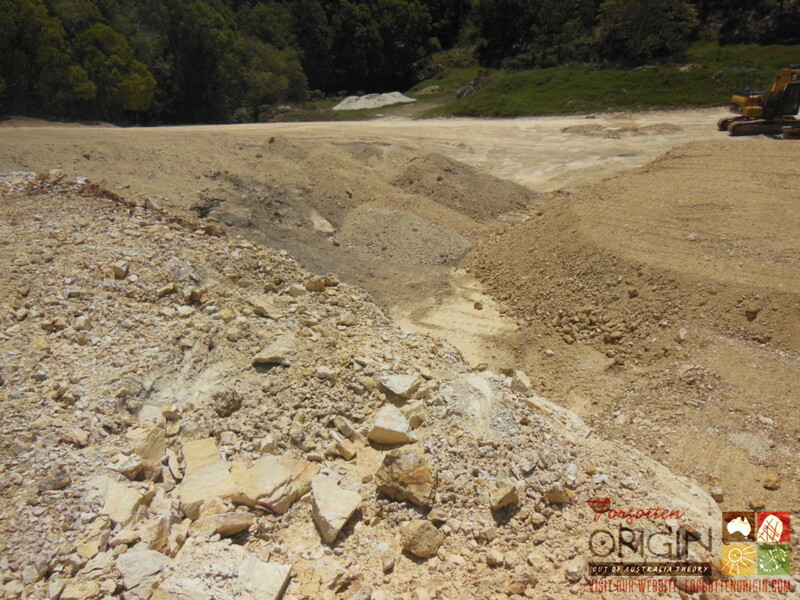 The quarry is used for gravel road bases, it is grey to brown in colour. Once leaving the confines of the quarry, there are other rocks on the surrounding pastures and in the forest to compare. Every other igneous rock on the property is grey and covered in lichen. The only exceptions are fourfold and all sit beside a road made long ago or one very recently constructed. The rocks covered in red patina and lacking in lichen are solely the province of these shallow road-side locations. 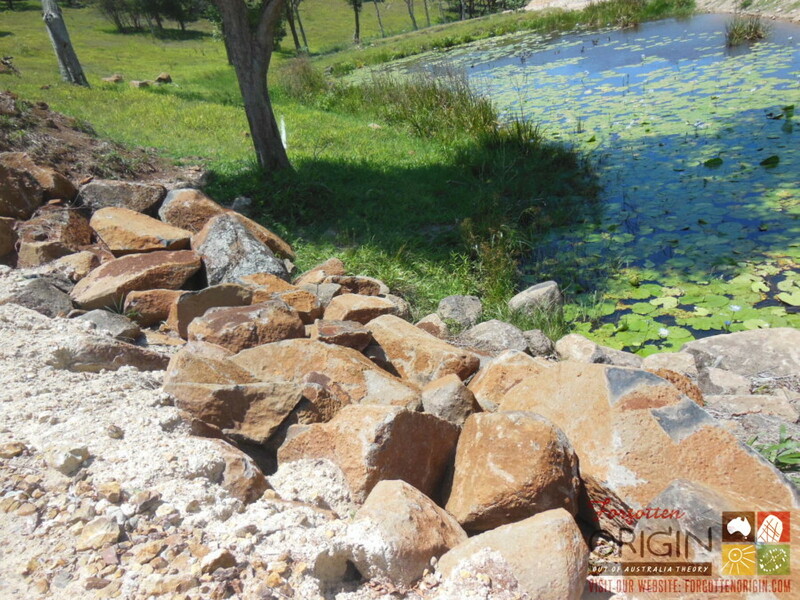 Ideal positions, beside a dam and the road leading into the quarry, if dumping an inconvenient and decidedly unwelcome load and once covered in soil, everything would go back to normal. Returning to the first stack, there is one deviation from the norm, a rather wide diversity in patina thickness, that runs counter to any suggestion these rocks share a common source. The patinas vary from five centimetres to less than one. The length of these rocks obeys no pattern, measuring from three metres to thirty centimetres with all positions in between addressed. That inconsistency is equally apparent when measuring height and width. Ignoring the irregularities of all dimensions, the crucial issue in the resurrection of these sacred rocks relates to why, after no less than sixty-five years of anonymity through burial, were these rocks unearthed? 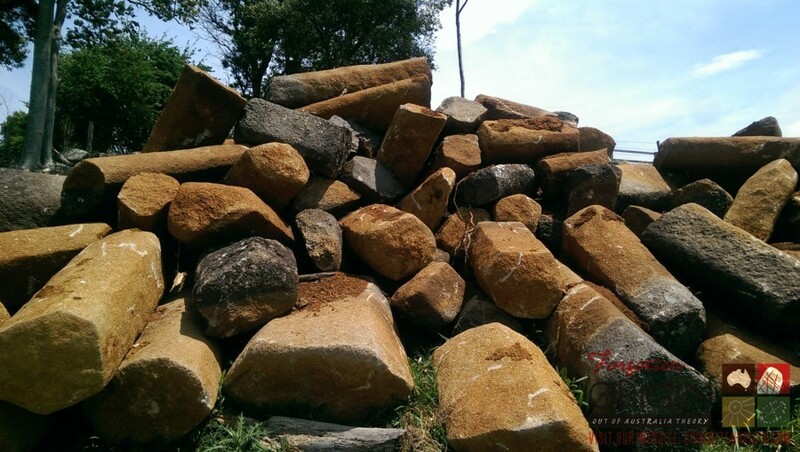 According to the owner, who has rung me personally to share his version of events, the rocks are from two natural outcrops on the property and he has no intention to sell any of these rocks. 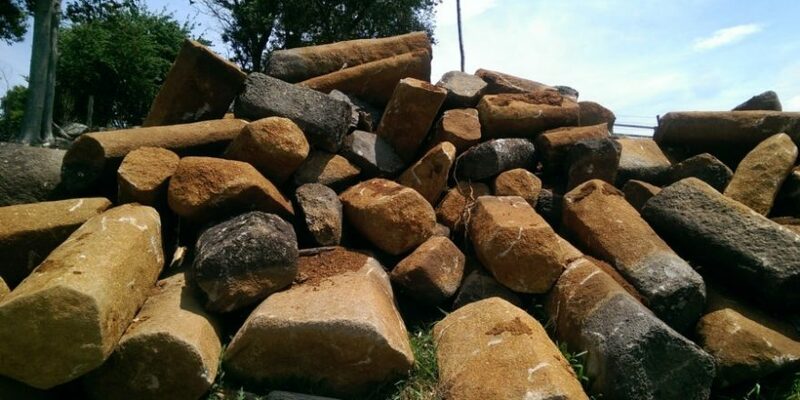 Yes, he was responsible for making sure the soil was removed and rocks stacked, tasks that would have taken days to complete and as a result costly, but the rocks will not, and have not, been sold. If the land is being subdivided and placed on the market with the intention of making a healthy profit, and before that the sole source of income was the unearthing of gravel to be sold for money, this seems a pointless and financially irresponsible use of machinery, resources and money in a non-income producing venture. This place is all about making money, and we believe that these rocks were uncovered and rearranged to facilitate money flow. In what only adds to the illogicality and loss of income, since our first visit, the first stack has been extensively remodelled and seems much smaller. 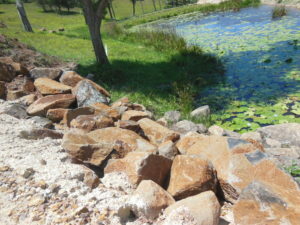 That reduction in quantity can’t be proved, but another session with the large machinery moving rocks weighing tonnes has occurred between visits, and knowing that the owner is adamant no money will be exchanged for any rock reclaimed from its place of burial, more money has gone down the gurgler. It was our understanding quarries make money by digging out rocks of value and selling them for a profit, that is their prime directive and we suspect, has or was about to take place here. Then we have what appears to be individual dirt lines on a variety of rocks from the first stack. The owner claims that the basalt rocks in the first stack were barely visible, with a few just protruding out of the ground a couple of inches. The problem is, the evidence on the ground and around many rocks seems to indicate these rocks were about one fifth submerged and four fifths standing above the ground. There is not one rock present that has a ‘dirt line’ that supports an almost total submersion. Some slabs have no ‘dirt line,’ while some do, and this again runs counter to the notion of a common source being anywhere near this quarry. 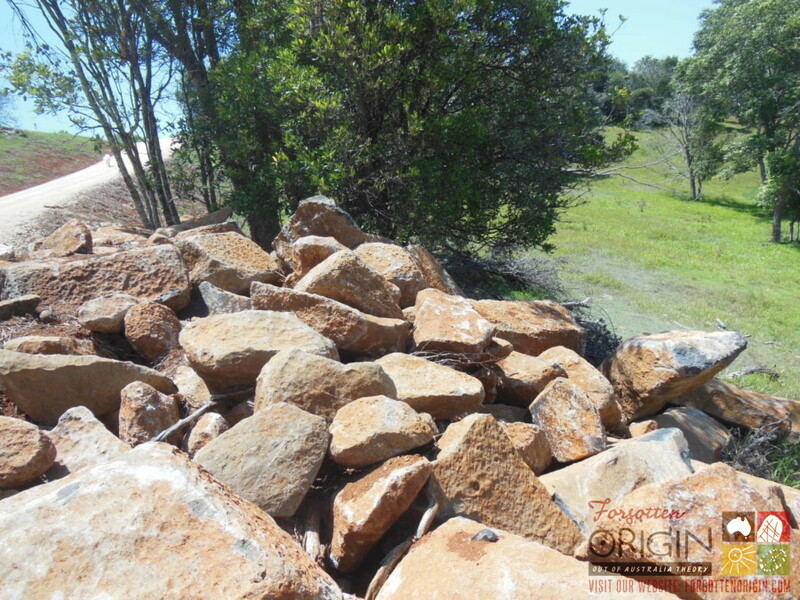 There are in combination many compelling reasons to believe all four clusters of rocks are imports, and if so, this happened early in the 1950’s, which happens to be thirty years before the current owner purchased the property that he is now subdividing. It could be that he stumbled on to these rocks in the early stages of planning this development and knew nothing of the history of the quarry and how or when these rocks were transported from the Standing Stones site. Or perhaps, he like many locals was aware of the deliberate concealment of these rocks, but it is something upon which we cannot be definitive beyond harbouring suspicions. There are two opposing explanations are on offer with a simple way to resolve this impasse, a simple check by a qualified geologist at all four deposits of basalt along with a brief examination of the surrounding countryside would be sufficient. Perhaps a soil analysis of the residue on the patina compared against soil found on the Standing Stones site and the immediate countryside will also assist in determining whether these rocks are long-term residents at the quarry or Standing Stones complex. Of course from every Original perspective, and that of the Elders involved, immediate protection is mandatory. The indications and circumstantial evidence is extremely convincing, but of course it is remotely possible that these rocks did not come from the Standing Stones complex. The solution is simple, let science prevail. 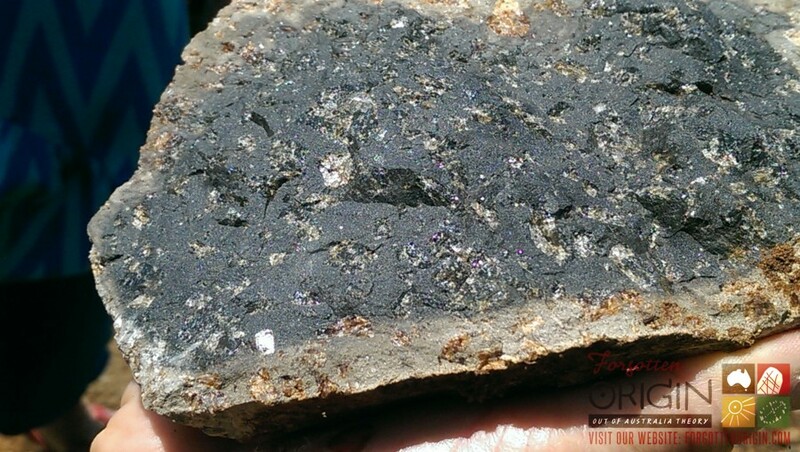 An inspection conducted by a qualified geologist can clear up whether the hundreds of basalt rocks are imports, or is indeed part of the natural lay of the geology. This particular site deserves no less than a formal rigorous investigation. 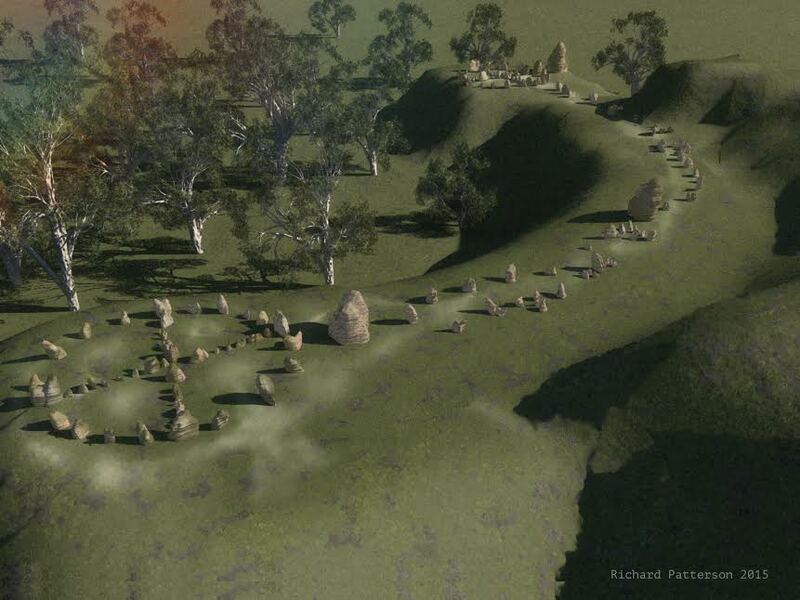 According to the President of the Australian Archaeological Society, Frederic Slater, the Standing Stones site is the oldest temple in the world and contains “the basis of all knowledge in the beginning, now and to come.” We have located the two mounds, the rocks that came from these mounds and elsewhere in the complex and, in what distinguishes this from the Stonehenge site in the UK, we also have the map compiled three months before the complex was destroyed stipulating where each rock was positioned, with the additional bonus of the sacred word given to each rock and what they mean. This is a lot more than they had at Stonehenge when it was reassembled through best guesses and good intentions. All of the relevant authorities have been informed some time ago, but as yet there has been no official response or any follow up contact. We know that the current owner has not been approached through official channels, nor has the site been thoroughly investigated. From our perspective, this inertia is ‘par for the course’ and this time around unforgivable. We are not asking anyone or department to pick sides, but they should at least have courtesy of acknowledging, looking and investigating using science. 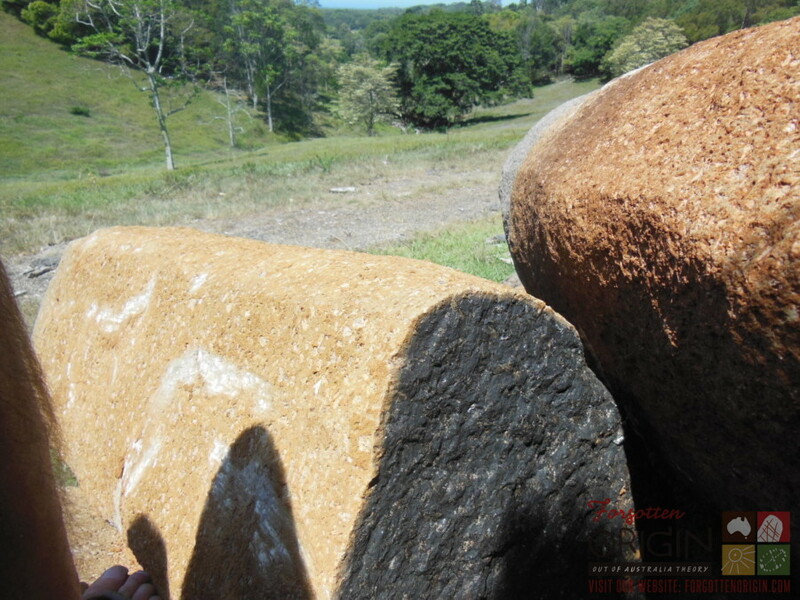 After all, according to the resident Australian expert academic of the time, these rocks are possibly the most important part of an archaeological puzzle that can literally rewrite world history. It’s really interesting to me that quarrying can leave behind loam soil. This makes me wonder if loam can be used, or if most workers only quarry for basalt or other stone. I would imagine that there would be a lot of uses for loam or other quarry sand and byproducts. My name is Marc Bright from Spirited by Nature -life changing experiences — can you tell me ‘is Hanwi and her friends/supporters planning to purchase the land and restore the sacred site? I remember because this is where again, we shall come together and celebrate for forty days and forty nights. Remembering what has been concealed by the corrupt and wicked ones of the Earth, who shall all be judged according to their deeds. I know, because I am the fourth Judges who has been sent! Their hearts shall be weighed against that of a feather, and if the feather us heavier, they shall have to return again and be given the same trials and teats until all are passed before they can continue on their journey to true enlightenment. Enlightenment without the use of their witchcraft or satanic rituals using the blood or drinking the blood of the original Earth tribes. Hi honey I sense not all will have the right to return. There are many places in all there is and this sifting is also judged by mother earth. People shall ask, “how do you know this, and where is your proof?, and to these questions I respond simply by saying, “because I remember”. We have been sending the message for the Earth tribes to begin preparing for the mass gathering. When this happens, we bring with us our musical instruments from the Northern hemisphere and from the Southern hemisphere. Remember, that there never has been an “East”, or a “west”. These notions were fabricated to divide the North from the South, which was created to cause mass division among Gods children, the children of light. We are all brothers and sisters under the ONE CREATOR. From one source we came, and to one source we shall return, and that source my family is, THE LIGHT! – Prophetess, Shaman, healer, spiritual teacher, leader, warrior, light worker and Daughter of Mother Earth and Father Sky. Yes, it is true. Thus place is a significant part of our cuture, heritage, sacred sites and history. We gather here every three thousand years. Like the animals mass migrate, so to do humans. You all return to the place where life began, at the roots of the tree of life. This is because the top part of our tree has been destroyed by mining, construction, disease, fear, oppression, famine and war. Now Gods children seek their haven once more. That is why so many nations have come to live here in our country, because it was and always will sacred lands. Because this is the place of birth for all mankind. You were here in the beginning and you will be here in the end when we all return home to the great sky country, in the heavens. -Deborah aka Queen Yala of the Earth tribes and Daughter and Messenger of Mother Earth and Father sky. It feels very important for these stones to be respected and returned to their places. Gaia needs the power places active again with loving intent. Any work we do to heal these places is so important in healing rifts and splits and bringing back the unity and respect for all beings. Woo-hoo!! fun times ahead guys….. let’s see if the leviathan of government extracts the digit this time around…..? One can only continue to align the forces to push the boat against the currents until we get to the slipstream……. Best Regards…. 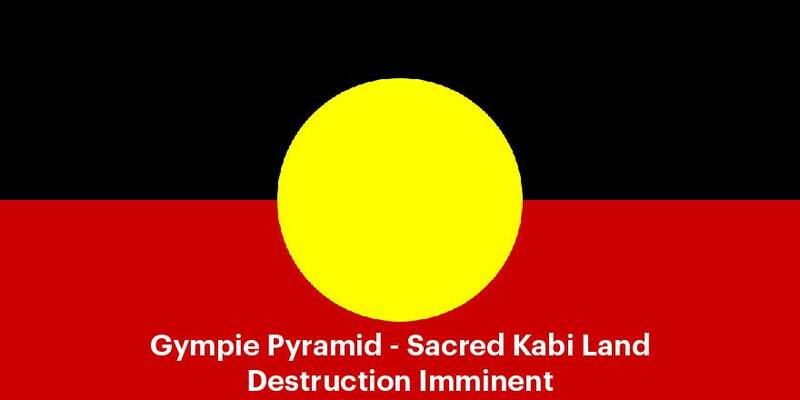 Well this is so long overdue and I’m pleased to see first hand that the Standing Stones will in fact be reinstated to there original plan as the first stone temple complex on the planet, and the sacred star rocks will be returned to Karta for all to share. Well done boys you came through and delivered on exactly what you said you were going to do…many blessings to you both!